Back of Beyond Baking: Christmas creativity in the Back Of Beyond. This week has been all about the Christmas cakes. I have iced four in the past week which has given me plenty of practice with fondant and royal icing. The most creative design was the gluten free Christmas cake which I iced first to reduce the risk of cross contamination. I liked the idea of making a Christmas present cake as this would indeed be a Christmas gift. After the rigmarole I had had with my previous bow attempts for my sisters cake I found a different Youtube clip showing an easier way to make a fondant bow. Ha ha ha! They might look easy in the video clips but do not be fooled. Anyone who says you can work with fondant shapes a few hours after making is fibbing. It needs to be left over night to totally harden otherwise it is just too fragile. 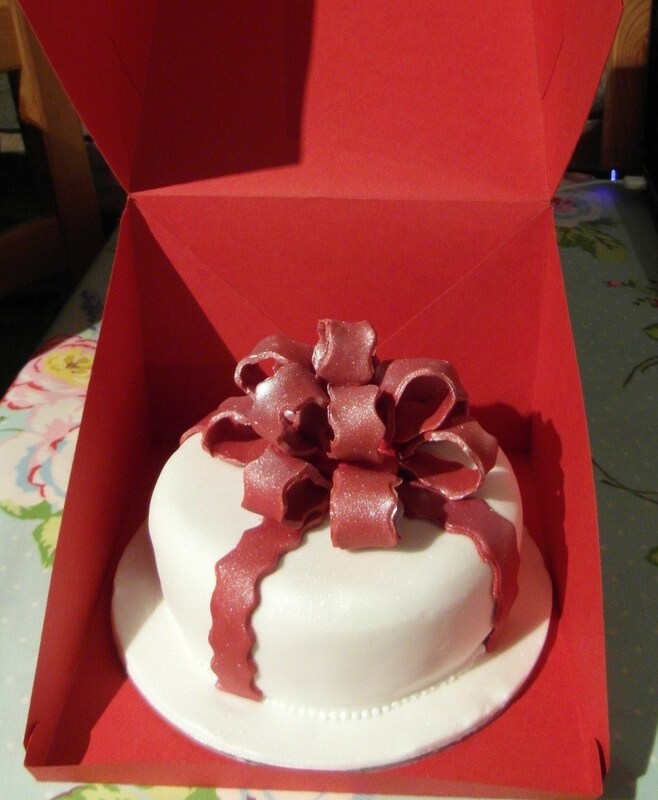 So after 2 attempts at the bow for that Christmas cake I decided to revert to an easier design for the other three! As well as the full sized Christmas cake I also produced some Santa and snowmen cupcakes from a design in the latest free Sainsburys Christmas magazine. Again I would question their instructions which states all you need is some fondant icing in a selection of colours and a round and serrated edge cutter. In reality I used at least 2 of my fondant tools for making Santa's beard. Although having looked at the BakingMad.com site which the recipe initially originated from their Santa has simpler styling. I used my own Vanilla cupcake recipe which you will find below! Preheat the oven to 190c. Line a cupcake pan with paper cases. Beat the butter and sugar together until pale and fluffy (at least 5 minutes). Add the eggs, flour, vanilla and milk and beat until smooth and a soft dropping consistency. If the mixture is a bit stiff add an extra drop of milk. Divide the mixture between the cupcake cases and place in the oven. Cook for 15 minutes or until a skewer inserted in the centre comes out clean. Decorate in any way you please! Number 3 trying out my new snowflake cutters! Snowflakes sprayed with pearl spray on number 4! Oooops thought my Christmas Cake was part of a separate post. I can only bow in awe at Mrs VC's skill. My gluten-free Christmas cake was an item of argument in our house (as to who would get to eat it all!!). I can only drool at the taste of the red icing bow! Utterly lush (as my daughter would say!). The cake was eaten within about 5 days (mostly by me!) and I already have my order in for next years cake!! Thank you Mrs VC - it was very yummy!! !